Solhem Companies, one of our more interesting clients, is a property developer in Minneapolis. We build and manage a Drupal 7 multi-site installation for their buildings including Solhavn, Soltva, and Nolo. They approached us last fall with a wish list that included updating their sites to match the Scandinavian ambiance of their buildings – sunny and light, friendly, modern and sustainable. Their team wanted to create a new theme that they could apply to all three existing websites and two new ones, for buildings under development. 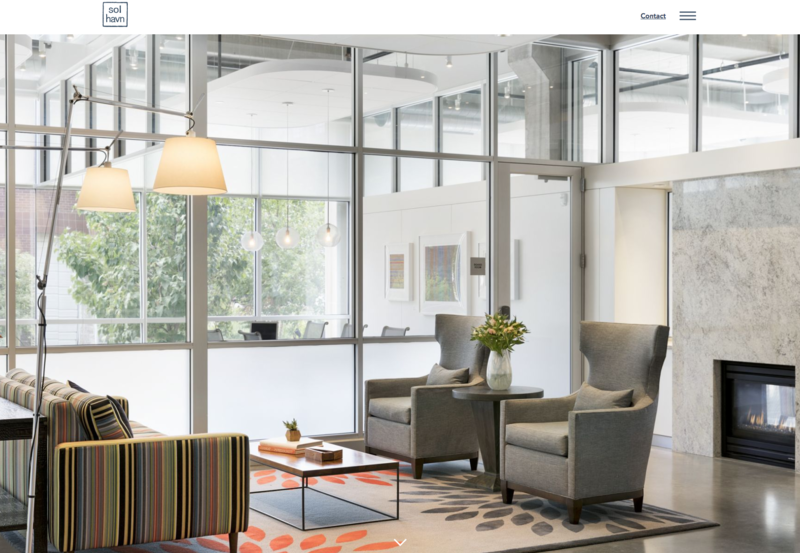 It was their intent that their theme would differentiate them from their competitors' sites, who mostly use a standard real estate website template, and would visually identify their buildings as belonging to the Solhem group of properties. The new minimalist theme with a long-scroll home page as featured on the new Solhavn site. The old theme with a short-scroll home page as seen on the former Soltva site. The Solhem websites are managed with a single theme, so updating the code for one affects all the sites. The benefit of this approach is that the client could continue to use the custom floor plan feature we’d created for their existing sites. It also spread their investment in the new theme over five sites, and reduced their support and maintenance costs. The client wanted to feature Instagram content to highlight neighborhood amenities like Attractions, Food & Drink, Recreation and Shopping. 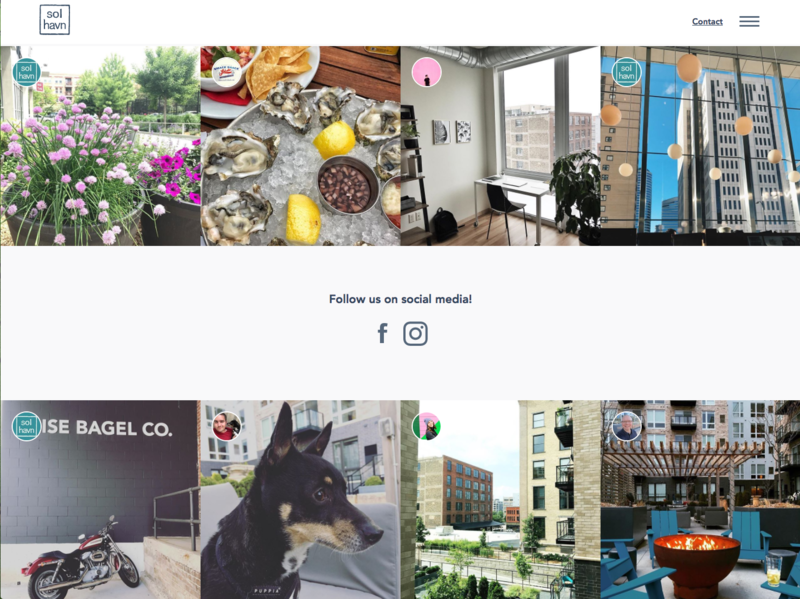 They also wanted to highlight selected Instagram content from each building’s community on an updated version of their Blog page. This required getting permissions from the content creators, a sensitive issue that we reviewed carefully with the client. In order for the Solhem staff to curate and update Instagram posts, we created a custom module that allows site administrators to retrieve and display Instagram images, including information about the photographer, automatically from within the site’s administration pages. Instagram content on the Solhavn site. The design process went through a few course corrections before all the client stakeholders were satisfied. Eva, our UX designer, brought the client's vision to life in digital form. Both of our teams were able to collaborate using InVision, a design prototyping platform. This project is a perfect example of how the design phase can take longer than planned, but how the extra time spent on designs contribute to a more considered, user focused site. Our talented front-end team implemented the designs with great care. Despite some unanticipated complications, we were able to complete this project within the estimated budget. It takes a surprising amount of work to render a clean, minimalist and elegant theme that works for multiple websites and is fully responsive for most devices and browsers! The client was especially excited to have the ability to manage selected Instagram content using the module we created for them. It took a little extra development time upfront but will save their webmaster time in the long run. We were delighted to see the Solhavn and Soltva sites unveiled along with splash pages for their new buildings, Lyndy and Borealis.